Linear accelerator (linac) has several advantages in comparison to telecobalt units.,,,, Department of Science and Technology, Government of India, has entrusted the responsibility of development of indigenous linac to one of its constituent units, Society for Applied Microwave Electronics Engineering and Research (SAMEER) under Jai Vigyan National Science and Technology Mission. Due to its development under indigenous technology, the machine has the potential of delivering cost-effective radiotherapy treatments in India. The linac unit is named as Siddharth and is capable of producing photon beam energy of 6 MV. Details can be found at https://www.sameer.gov.in/linearaccelerators. The purpose of the present study is to develop Monte Carlo model of 6 MV Siddharth linac unit using the Monte Carlo-based BEAMnrc user-code  of the EGSnrc  Monte Carlo code system and benchmark this model against the measured data. The calculated dose data are based on the DOSXYZnrc user code  of the EGSnrc code system. In the study, simulations were carried out for different incident electron beam parameters. The geometry of the linac unit was simulated based on the manufacturer's detailed information using the BEAMnrc user code  of the Monte Carlo-based EGSnrc code system. 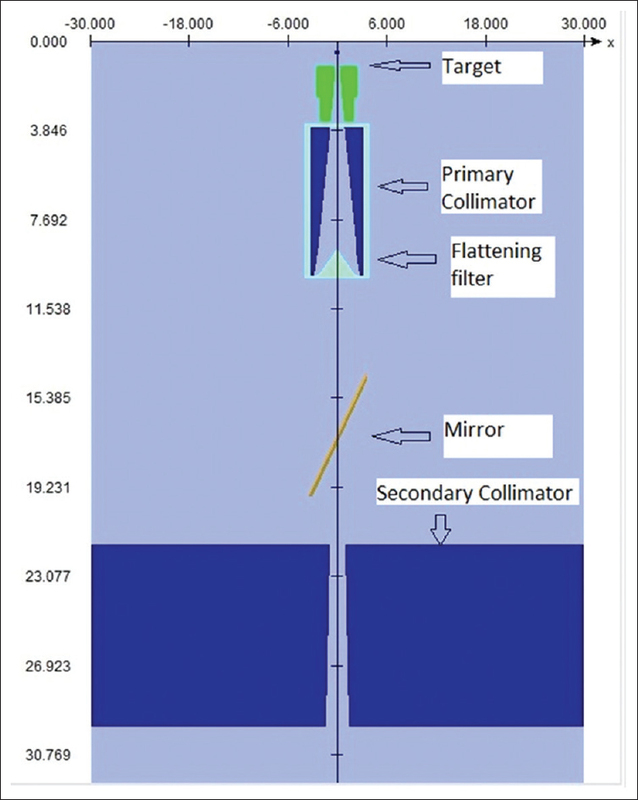 In this study, different components of the treatment head such as target, primary collimator, flattening filter, monitor chamber, mirror, and secondary collimator were modeled. [Figure 1] shows the display of linac modeled in the present study using the BEAMnrc user code. In this simulation, the z-axis is taken along the beam axis, and the origin is taken at the front face of the target. Incident electron parameters play an important role in the dose distributions. To identify appropriate electron parameters, following three cases were studied. For each case, the kinetic energy of the incident electron was varied from 6 to 6.5 MeV (0.1 MeV increment). As per the manufacturer's specification, the electron beam is a point and divergent with a half-angle of 14°. The source is positioned on Z-axis and 4 mm above the target [Figure 2]. The radius of the beam at the target is 1 mm. 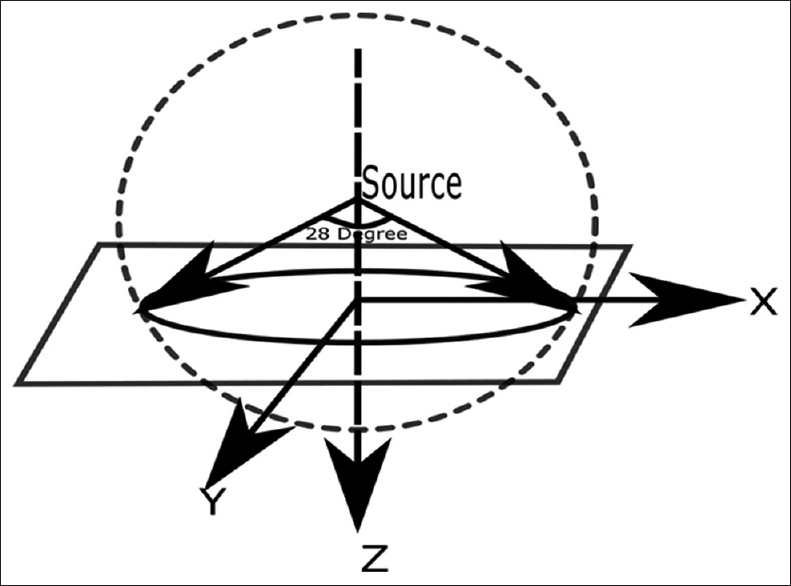 In this case, the incident electron beam is a circular parallel beam with a diameter of 2 mm [Figure 3]. The electron beam is incident in the XY plane. In this case, the beam is circular, and the spatial distribution of electrons is defined by a Gaussian intensity distribution [Figure 4]. 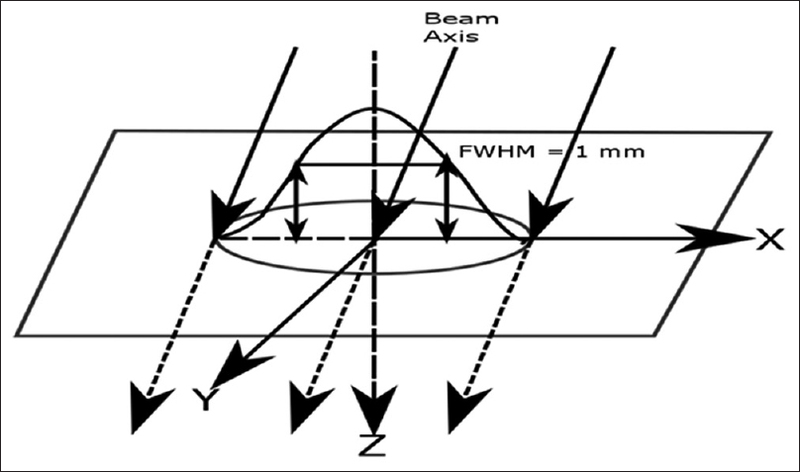 The Full Width Half Maximum (FWHM) of the incident beam is considered to be 1 mm in both X and Y directions. The Monte Carlo simulations were done in two steps. To identify the incident electron beam parameters, initial simulations were carried out for 10 cm × 10 cm field size and depth of 10 cm. 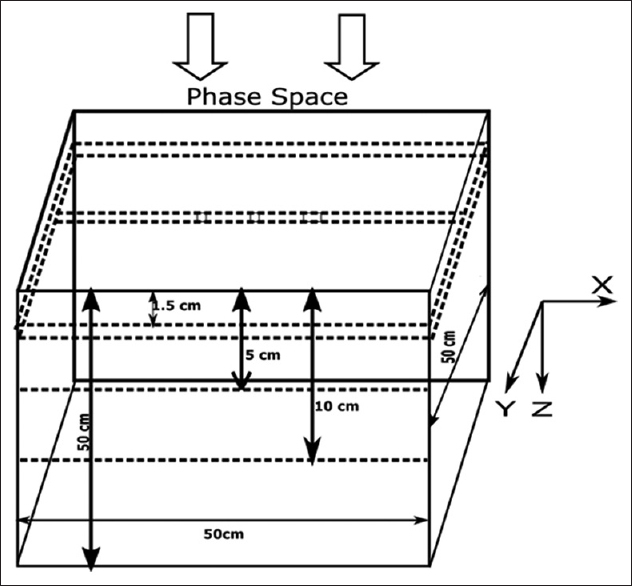 In the first step, phase space file for each of the above cases was scored at 100 cm from the target using the BEAMnrc user-code. In the BEAMnrc simulations, the electron transport cutoff (ECUT) and photon transport cutoff (PCUT) energies were set to 0.7 and 0.01 MeV, respectively. Secondary electron production cutoff (AE) and bremstrahlung production cutoff (AP) values were set to 0.521 and 0.01 MeV, respectively. Range rejection was turned on with ESAVE value of 0.7 MeV in the target and 2 MeV in other components of the linac. The number of histories for Monte Carlo calculation was set 6 × 109 particles. In the second step, the phase space data from aforementioned simulations served as the source for the simulations using the DOSXYZnrc user code. This user code is capable of performing 3D absorbed dose calculations in Cartesian coordinates in the water phantom. In DOSXYZnrc, the water phantom size was 50 cm × 50 cm × 50 cm and the phase space source was positioned on the water surface, i.e. at Z = 100 cm. [Figure 5] represents the voxel phantom set up in the DOSXYZnrc simulations. The water phantom was divided into a number of voxels. For high-dose gradients regions, small voxel sizes were adapted. For central axis PDD simulation, up to a depth of 2 cm, absorbed dose was scored in voxel dimension of 1.0 cm × 1.0 cm × 0.05 cm and for depths from 2 to 25 cm, voxel dimension of 1.0 cm × 1.0 cm × 0.1 cm were considered. The beam profiles (both X and Y directions) were calculated at three different depths such as dmax (1.5 cm), 5 cm and 10 cm. For beam profile simulations, different voxel dimensions were chosen for the shoulder, penumbra, and flattened regions. For example, for dose profile simulation in X-direction for a field size of 10 cm × 10 cm voxel dimensions of 0.1 cm × 1.0 cm × 0.1 cm (from −4.0 to +4.0) for flattened region and 0.05 cm × 1.0 cm × 0.1 cm for shoulder and penumbra regions (from −7.5 to −4.0 and +7.5 to +4.0) were used. The EGSnrc parameters set for DOSXYZnrc simulation were ECUT = AE = 0.521 MeV, PCUT = AP = 0.01 MeV. All the simulations utilized PRESTA-II electron step length algorithm. Up to 6 × 109 particle histories were followed in the simulation. The statistical uncertainties associated with the absorbed dose values were <0.5%. Dose measurements were carried out by a PTW MP3 Water Scanning System and ionization chamber (Semiflex 0.125 cm 3). The measurements were performed with 1 mm resolution for both PDD and beam profiles. Field sizes considered were from 5 cm x 5 cm to 25 cm x 25 cm at a SSD of 100 cm. Beam profiles were measured at three different depths, i.e. depth of maximum dose (dmax), 5 cm and 10 cm for both X and Y directions. The overall uncertainty in the dose measurement using the water phantom scanning system is estimated up to a maximum value of 2%. This uncertainty is attributed to positioning inaccuracy of the chamber up to 1 mm and fluctuations of chamber and electrometer, air pressure, and temperature during the time frame of one scan. 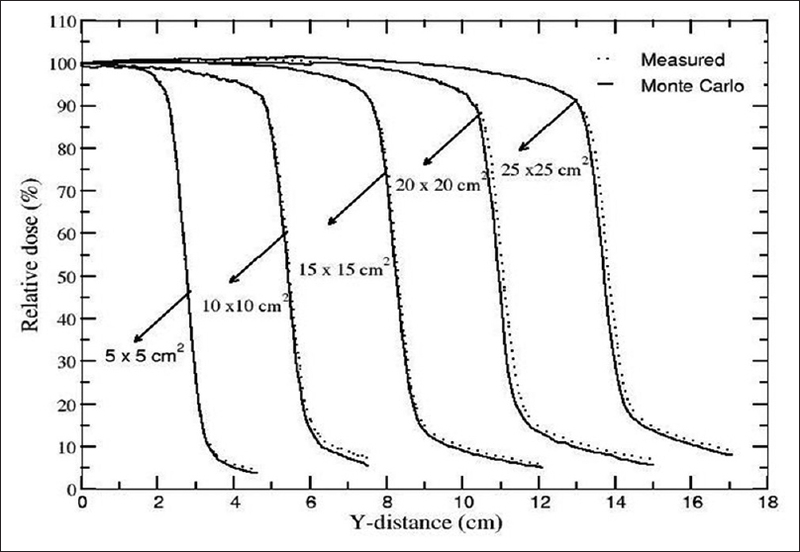 Analysis of central axis percentage depth dose (PDD) data for 10 cm × 10 cm suggests that for a given incident electron beam energy, PDD is almost insensitive to the incident electron beam parameters. PDD values also do not differ significantly with the investigated incident electron beam energies of 6–6.5 MeV. The relative difference between the calculated depth-dose distributions (10 cm × 10 cm field size) for beam energies 6 and 6.5 MeV was <1.5%. The PDD values at a depth of 10 cm, %dd (10), for a field size of 10 cm × 10 cm, corresponds to the beam quality. [Figure 6] presents the %dd (10) values for the investigated electron beam energies which have Gaussian distribution (FWHM = 1 mm). As the energy increases, there is a marginal increase in the value of %dd (10). The same trend was observed for the cases 1 and 2. 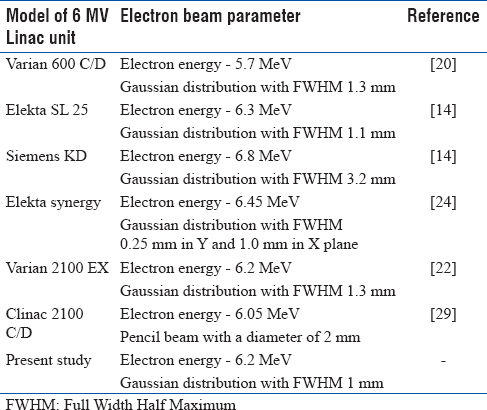 For the incident electron beam energy of 6.2 MeV (Gaussian with FWHM = 1 mm), the calculated value %dd (10) is 66.3% which is in close agreement with the measured value of 67% carried out in the present study. The overall conclusion is that for the incident electron beam energy of 6.2 MeV, irrespective of the cases investigated (cases 1–3), the agreement between the calculated PDD values and the measurements is <1%. 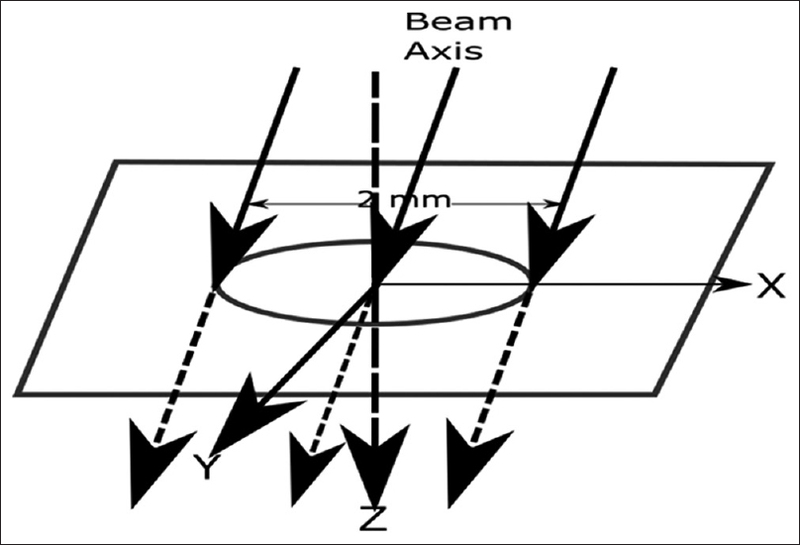 However, the beam profiles are sensitive to the incident electron beam parameters. 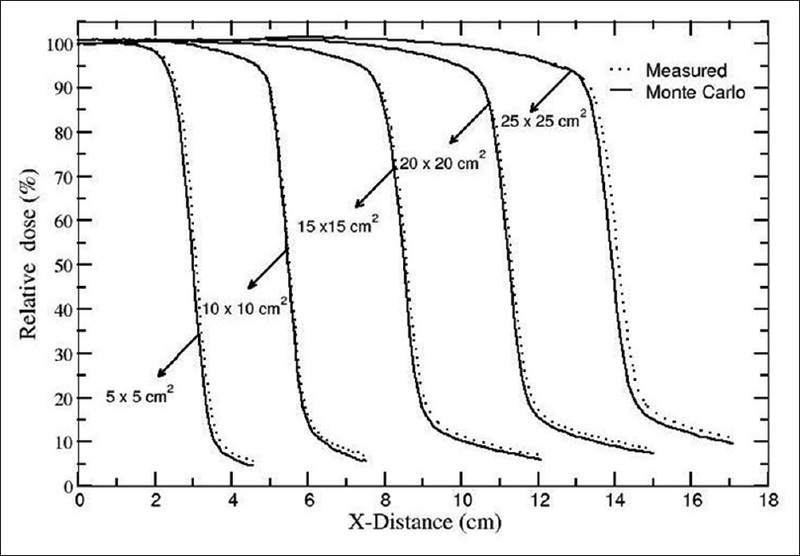 [Figure 7]a presents the comparison of Monte Carlo-calculated profile in X-direction for incident electron beam energies 6.0, 6.2, 6.5 MeV and measured data for a field size of 10 cm × 10 cm and at a depth of 10 cm for point divergent source (case 1). [Figure 7]b and c present the above comparison for the parallel circular beam (case 2) and Gaussian distribution (case 3), respectively. It was observed that beam profile horns were reduced as the incident electron beam energy increases. Lower energy beams produce horns at the edge of the radiation field while higher ones correspond to flat profiles. An energy difference of 0.1 MeV causes a dose difference at the edge of the field by about 1%. Above discussion demonstrates that the dose profile resulting from 6.2 MeV of electrons with Gaussian distribution (case 3) provides optimum agreement with the measurements. 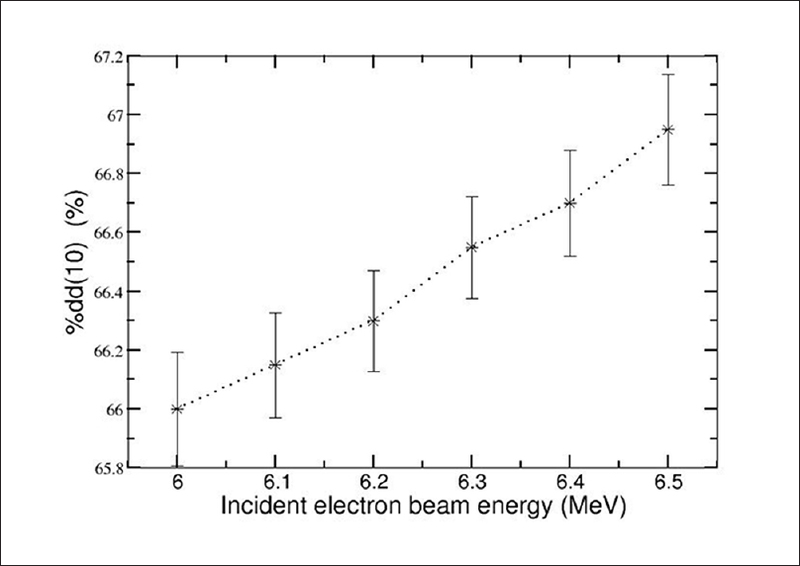 [Figure 7]d compares the investigated cases with incident electron beam energy of 6.2 MeV with measured data. For all the investigated cases, beam parameters such as left penumbra (LP), right penumbra (RP), beam flatness and beam symmetry were investigated. [Table 1] presents these parameters analyzed from the calculated beam profiles of all the investigated electron beam parameters for the field size of 10 cm × 10 cm. Measured data are also included for comparison. For case 1, both RP and LP were <6 mm which is less than the measured values of 6.9 mm. Beam symmetry and flatness were observed to be higher than the measured as well as the tolerance values (103% and 106%) as quoted by the IEC protocol. For case 2, both RP and LP were <5.5 mm which is less than the measured values of 6.9 mm. Beam flatness was observed to be higher than the measured as well as the tolerance values. However, beam symmetry was within the acceptable range for all the beam energies. For case 3, all the parameters such as RP, LP, symmetry, and flatness were in good agreement with the measured values at beam energy 6.2 MeV with the Gaussian distribution. [Figure 6] and [Figure 7] and [Table 1] demonstrate that Monte Carlo calculations using the incident electron beam energy of 6.2 MeV with Gaussian distribution (FWHM = 1 mm) produce dose distributions which agree with the measurements. [Table 2] presents the incident electron beam parameters concluded by the other investigators which result in dose distribution comparable to the measurements. 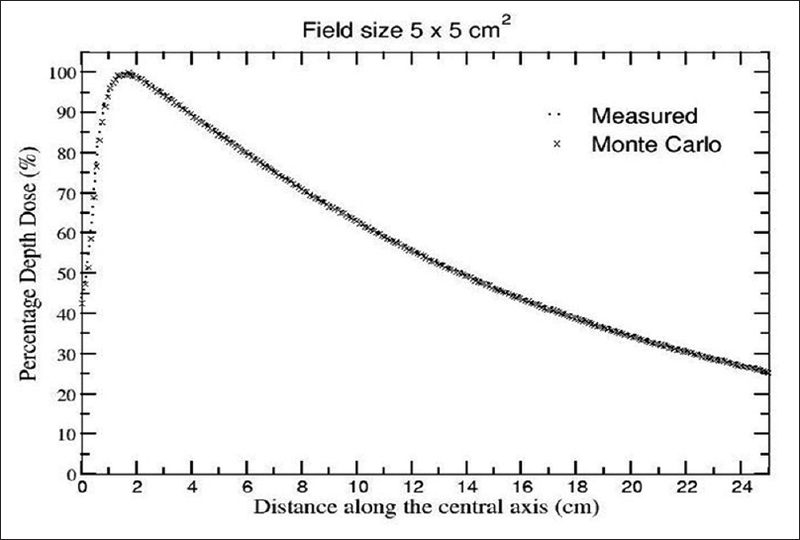 Further Monte Carlo simulations were carried out for other field sizes such as 5 cm × 5 cm, 15 cm × 15 cm, 20 cm × 20 cm and 25 cm × 25 cm for a mono-energetic electron beam of kinetic energy 6.2 MeV with the Gaussian distribution of FWHM = 1 mm. PDDs were calculated for depths from 0 to 25 cm, and beam profiles (both X and Y directions) were calculated at three different depths of dmax (1.5 cm), 5 cm and 10 cm for the above field sizes. The calculated PDD and beam profiles for all the above field sizes were compared with the measured data and a good agreement was found. The dose difference between the calculated and measured PDD values were under 1% for all the investigated field sizes. 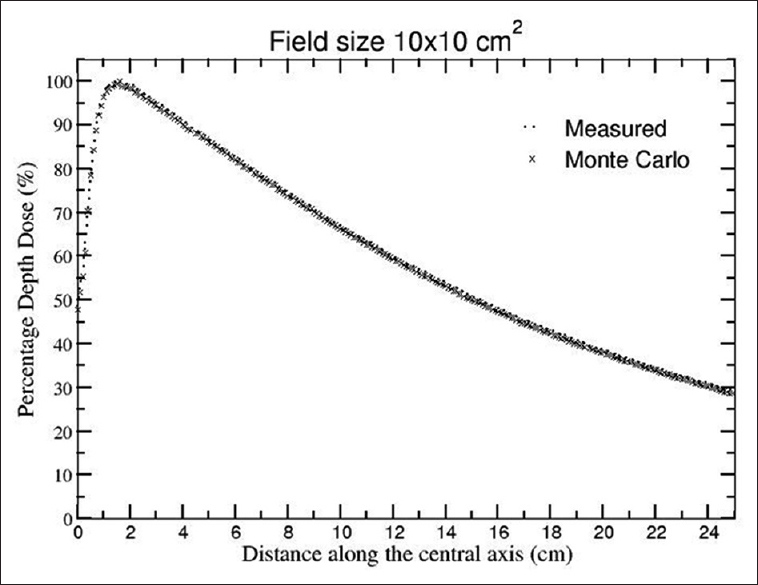 Both Monte Carlo-calculated and measured depth of dmax was found to be at 1.52 cm for a field size of 10 cm × 10 cm. The differences between calculated and measured values were <1% in the tail region and <0.5% in the superficial depth region for all the investigated field sizes. Calculated and measured PDD values are shown in [Figure 8], [Figure 9], [Figure 10] for field sizes of 5 cm × 5 cm, 10 cm × 10 cm and 25 cm × 25 cm, respectively. 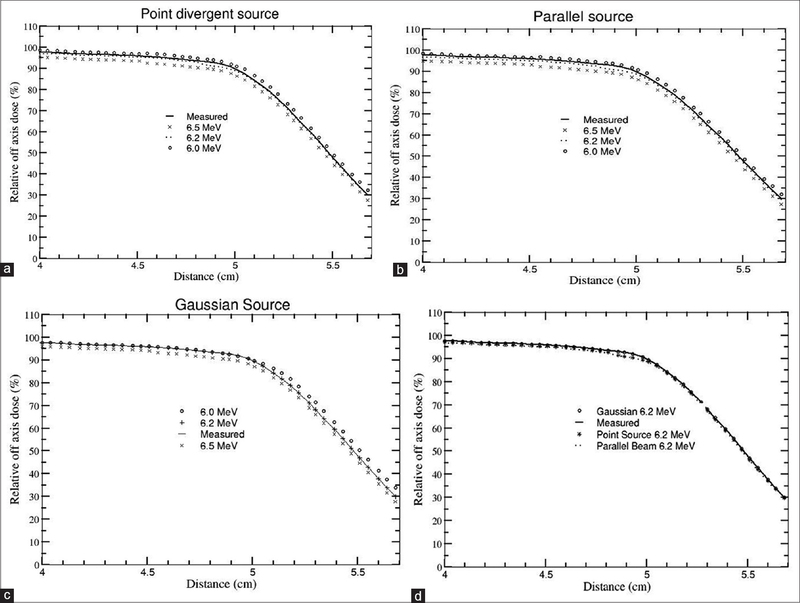 For beam profiles, the difference between calculated and measured dose values was <1%, except for the border points where the maximum deviation between calculated and measured dose values were found to be around 1.8%. [Table 3] presents the comparison of Monte Carlo-calculated and measured beam profile parameters such as LP, RP, flatness, and symmetry for all the investigated field sizes. 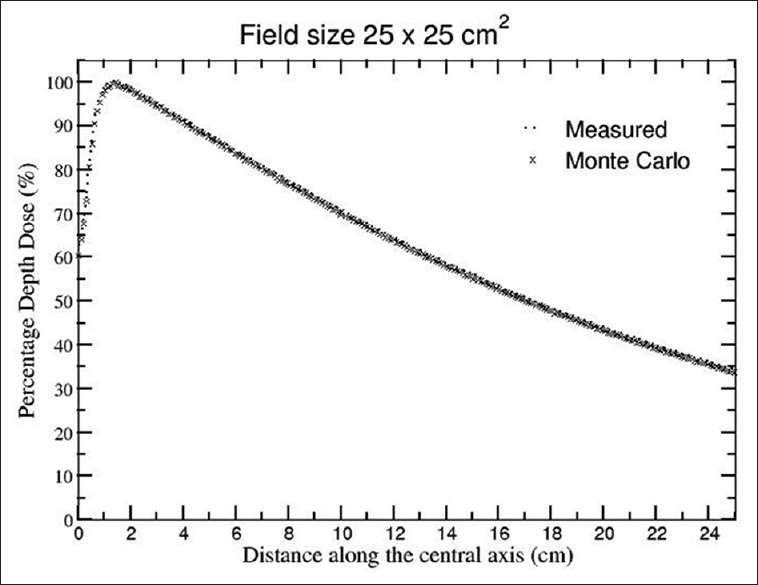 Monte Carlo-calculated values were found to be in excellent agreement with the measured values for the field sizes. Calculated and measured X-profiles and Y-profiles for all the investigated field sizes at a depth of 10 cm are presented in [Figure 11] and [Figure 12], respectively. Statistical uncertainties on the calculated dose values for each voxel were mostly below 0.2% and about 0.7% for regions near field edge. The indigenous linac unit Siddharth of photon energy 6 MV was simulated using the Monte Carlo-based BEAMnrc code. The dosimetric parameters such as PDD and beam profile were calculated using the DOSXYZnrc user-code of the EGSnrc code system, and the results were compared with the measured data. In the study of the influence of electron beam parameters on photon beam characteristics, five different incident electron beam energies (6-6.5 MeV) and three different type of radial intensity distribution of electron beam (case 1, 2 and 3) were chosen. It was found that the central axis relative depth dose values, i.e. PDDs are quite insensitive to variations in the electron beam radial intensity distribution. However, the beam profiles are sensitive to the incident electron energy as well as the radial intensity distribution of the incident electron beam. The calculated PDD and lateral beam profiles for 5 cm × 5 cm, 10 cm × 10 cm, 15 cm × 15 cm, 20 cm × 20 cm and 25 cm × 25 cm field sizes were compared with the measured data and a good agreement was found when the calculated dose profiles utilized the combination of incident electron beam energy of 6.2 MeV and the Gaussian distribution with FWHM of 1.0 mm. The authors would like to Dr. D. Datta, Head, Radiological Physics and Advisory Division, Bhabha Atomic Research Centre, and Dr. A. U. Sonawane, Head, Directorate of Regulatory Affairs and Commumnications, Atomic Energy Regulatory Board for their encouragement and support throughout the study. The authors would also like to thank Dr. K. P. Ray, Program Director, SAMEER Mumbai, India for his technical support in the study. Matcalfe P, Kron T, Hoban P. The Physics of Radiotherapy X-Rays from Linear Accelerators. Madison, Wisconsin: Medical Physics Publishing; 1997. Adams EJ, Warrington AP. A comparison between cobalt and linear accelerator-based treatment plans for conformal and intensity-modulated radiotherapy. Br J Radiol 2008;81:304-10. Thwaites DI, Tuohy JB. Back to the future: The history and development of the clinical linear accelerator. Phys Med Biol 2006;51:R343-62. Khan FM. The Physics of Radiation Therapy. 4th ed. Baltimore: Lippincott; 2010. Page BR, Hudson AD, Brown DW, Shulman AC, Abdel-Wahab M, Fisher BJ, et al. Cobalt, linac, or other: What is the best solution for radiation therapy in developing countries? Int J Radiat Oncol Biol Phys 2014;89:476-80. Rogers DW, Faddegon BA, Ding GX, Ma CM, We J, Mackie TR, et al. BEAM: A Monte Carlo code to simulate radiotherapy treatment units. Med Phys 1995;22:503-24. DeMarco JJ, Solberg TD, Wallace RE, Smathers JB. A verification of the Monte Carlo code MCNP for thick target bremsstrahlung calculations. Med Phys 1995;22:11-6. Keall PJ, Siebers JV, Arnfield M, Kim JO, Mohan R. Monte Carlo dose calculations for dynamic IMRT treatments. Phys Med Biol 2001;46:929-41. Solberg TD, DeMarco JJ, Chetty IJ, Mesa AV, Cagnon CH, Li AN, et al. A review of radiation dosimetry application using the MCNP Monte Carlo code. Radiochim Acta 2001;89:337-55. Fix MK, Manser P, Born EJ, Mini R, Rüegsegger P. Monte Carlo simulation of a dynamic MLC based on a multiple source model. Phys Med Biol 2001;46:3241-57. Das IJ, Kassaee A, Verhaegen F, Moskvin VP. Interface dosimetry: Measurement and Monte Carlo simulations of low-energy photon beams. Radiat Phys Chem 2001;61;593-5. Jiang SB, Kapur A, Ma CM. Electron beam modeling and commissioning for Monte Carlo treatment planning. Med Phys 2000;27:180-91. Deng J, Jiang SB, Kapur A, Li J, Pawlicki T, Ma CM, et al. Photon beam characterization and modelling for Monte Carlo treatment planning. Phys Med Biol 2000;45:411-27. Mesbahi A, Fix M, Allahverdi M, Grein E, Garaati H. Monte Carlo calculation of Varian 2300C/D linac photon beam characteristics: A comparison between MCNP4C, GEANT3 and measurements. Appl Radiat Isot 2005;62:469-77. Lin SY, Chu TC, Lin JP. Monte Carlo simulation of a clinical linear accelerator. Appl Radiat Isot 2001;55:759-65. Sangeetha S, Sureka CS. Comparison of flattening filter (FF) and flattening-filter-free (FFF) 6 MV photon beam characteristics for small field dosimetry using EGSnrc Monte Carlo code. Radiat Phys Chem 2017;135:63-75. Keall PJ, Siebers JV, Libby B, Mohan R. Determining the incident electron fluence for Monte Carlo-based photon treatment planning using a standard measured data set. Med Phys 2003;30:574-82. Aljarrah K, Sharp GC, Neicu T, Jiang SB. Determination of the initial beam parameters in Monte Carlo linac simulation. Med Phys 2006;33:850-8. Almberg SS, Frengen J, Kylling A, Lindmo T. Monte Carlo linear accelerator simulation of megavoltage photon beams: Independent determination of initial beam parameters. Med Phys 2012;39:40-7. Tzedakis A, Damilakis JE, Mazonakis M, Stratakis J, Varveris H, Gourtsoyiannis N, et al. Influence of initial electron beam parameters on Monte Carlo calculated absorbed dose distributions for radiotherapy photon beams. Med Phys 2004;31:907-13. Pena J, González-Castaño DM, Gómez F, Sánchez-Doblado F, Hartmann GH. Automatic determination of primary electron beam parameters in Monte Carlo simulation. Med Phys 2007;34:1076-84. Bush K, Zavgorodni S, Beckham W. Inference of the optimal pretarget electron beam parameters in a Monte Carlo virtual linac model through simulated annealing. Med Phys 2009;36:2309-19. Fix MK, Stampanoni M, Manser P, Born EJ, Mini R, Rüegsegger P, et al. A multiple source model for 6 MV photon beam dose calculations using Monte Carlo. Phys Med Biol 2001;46:1407-27. Björk P, Knöös T, Nilsson P. Influence of initial electron beam characteristics on Monte Carlo calculated absorbed dose distributions for linear accelerator electron beams. Phys Med Biol 2002;47:4019-41. Rogers DW, Walters B and Kawrakow I. BEAMnrc users Manual. PIRS 509(A) Rev. Ottawa, ON: National Research Council of Canada; 2016. Yani S, Dirgayussa I, Gde E, Rhani MF, Haryanto F, Arif I. The effect of voxel size on dose distribution in Varian Clinac i×6 MV photon beam using Monte Carlo simulation. AIP Conf Proc 2015;1677:040002.
International Electrotechnical Commission- IEC 60977-2. Medical Electrical Equipment – Medical Electron Accelerators – Guidelines for Functional Performance Characteristics. IEC/TR 60977; 2008.